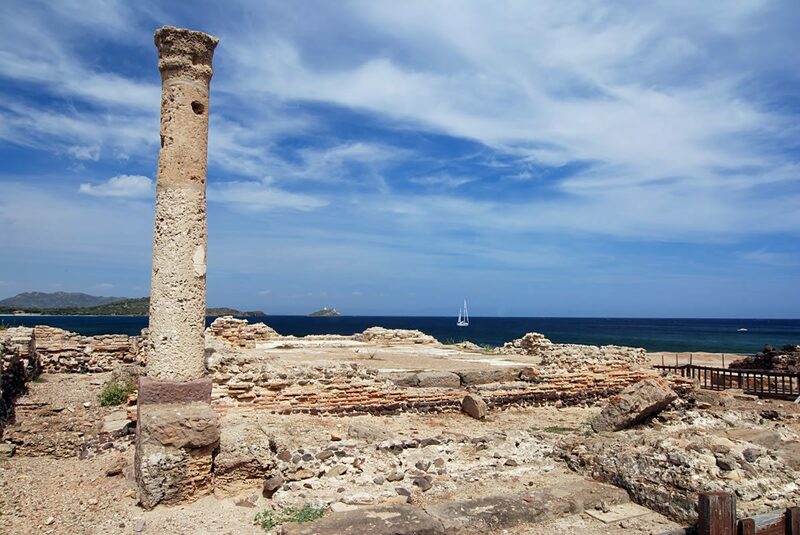 If you love the ancient world and you are spending your holidays on the South coast of Sardinia, we suggest you visit the ancient city of Nora. A few km from Cagliari and within the town of Pula, the sunken city of Nora is considered one of the oldest towns in Sardinia. The archaeological site of Nora enjoys a scenic location on the sea front, situated on the capo di Pula between two hills: Sa Punta and Su Coloru and Coltellazzo, dominated by the Spanish Tower. The antiquity of the Foundation of Nora is testified by a Phoenician stele dating back to IX-VIII B.C, preserved at the Archaeological Museum of Cagliari, where the word Sardinia: “Shrdn”, is first mentioned. The peninsula has hosted the Phoenicians, Carthaginians and Romans, all of whom transformed the scenario, leaving traces of their occupation, until the Middle Ages, when the city was abandoned after the Arab invasions. Directions: from Cagliari take the SS 195, at Km 27, turn left towards Pula. Crossing the town, take the Viale Nora and you will get to the archaeological area.At the entrance you will find a panoramic rest area and a bookshop. Entrance tickets: The archaeological area can be visited from 9.00 to 20.00, uninterrupted.There is a highly recommended guide service that will explain the entire history of the city. The cost of the ticket is € 5.50,€ 4 (for groups of more than 20), € 2.50 (under 14 years). The ruins of Nora are breathtakingly beautiful. After this visit, you can go for a splash in the crystal clear waters of the beach of Nora.